Veneration of the Sacred Heart of Jesus has gotten a bum rap. For many people, Catholics and otherwise, the seemingly effeminate images of Our Lord pointing to His — literally — bleeding heart were dismissed as purely private devotional images best suited for old ladies. For others, such things as placards identifying the driver of a car as a member of the Auto League of the Sacred Heart were the worst kind of kitsch. For still more folks of a thoughtful nature, it was all well enough in its way, but a relatively recent devotion without deep roots in Catholic history. All of these notions are dead wrong. Their refutation begins with Scripture, specifically the Gospel of St. John, 15:13 — “Greater love than this no man hath, that a man lay down his life for his friends.” Christ said it, and then went on to do it on the Cross. In so doing, He redeemed the human race — opening Heaven to all who accepted His gifts. What were these gifts? “But one of the soldiers with a spear opened his side, and immediately there came out blood and water.” (St. John, 19:34). That outpouring of blood and water from His Sacred Heart symbolised the Eucharist and Baptism, the two Sacraments around which the other five revolve. But with these life-giving gifts made available to all mankind came something else: an obligation laid upon those who would receive Him. As Pius XI wrote in his encyclical, Quas Primas, “But a thought that must give us even greater joy and consolation is this that Christ is our King by acquired, as well as by natural right, for he is our Redeemer. Would that they who forget what they have cost their Savior might recall the words: ‘You were not redeemed with corruptible things, but with the precious blood of Christ, as of a lamb unspotted and undefiled.’ We are no longer our own property, for Christ has purchased us ‘with a great price’; our very bodies are the ‘members of Christ.’” We are rightfully His subjects not only by His creation of the Universe and all therein, nor just by His descent from King David, but also by conquest — His conquest of our sins upon the Cross. “There is a safe and sure rest for weak and sinful men in the wounds of the Saviour. I dwell in them secure; the interior of His heart lies open to me through the wounds. Whatever is wanting to me, I take for myself from the heart of my Lord; for His mercies are overflowing, nor are holes lacking by which they may flow out. Through the holes in the body appear to me the secrets of the heart; there appears the great mystery of His love, the mercy of our God in which the Orient from on high has visited us.” (Hugh of St. Victor, De Anima, Lib. IV, XXI: PL 177, 181). This mystical interplay had produced the Church; but the Church was not to be taken to be a merely spiritual, invisible body. Constantine the Great had legalised and favoured her, being acclaimed a Saint as a result. His later successor, Theodosius the Great, received similar treatment, partly in tribute to his making Catholicism the State Church of the Empire and baptism entrance into Roman citizenship. Although the Empire was tottering politically as Germanic tribes set up their kingdoms within its shrinking boundaries, the concept of Christendom — a political polity enfolding all who claimed to be followers of Christ — had emerged. Such figures as Justinian and Charlemagne who attempted to restore the Empire were not trying to breathe life into the realm of the pagan Caesars, but to give this Christendom concrete and effective reality. The cultus of the Military Saints — loyal soldiers who nevertheless accepted martyrdom rather than apostatise, or later warriors who fought the external enemies of the True Faith — arose, and their sacrifices were identified with of Christ; they too had laid down their lives for their friends. Within Christendom, many of the nations who arose within its undefined boundaries were similarly raised to the altars: England’s St. Edward the Confessor; Scotland’s St. Margaret; France’s St. Louis; Hungary’s St. Stephen; Bohemia’s St. Wenceslaus; Spain’s St. Ferdinand; Denmark’s St. Canute; Sweden’s St. Erik; Norway’s St. Olaf; Poland and Lithuania’s St. Casimir; Russia’s St. Vladimir; Serbia’s St. Sava; Bulgaria’s St. Boris; and many, many more. The Holy Roman Emperor was a canon of both St. Peter’s Basilica and Aachen Cathedral; the King of France enjoyed the same privilege at St. John Lateran and various other churches in his realm; and the King of Spain atSt. Mary Major. Even the King of England was an honorary monk of St. Paul’s Outside the Walls (whose abbot was in return prelate of the Order of the Garter) and a canon of St. David’s Cathedral in Wales. Imperial and Royal monasteries and parishes abounded, each ruler’s court had an official chaplaincy, and all of them were expected to participate publicly at the liturgy of such feast days as the Epiphany, Maundy Thursday, Good Friday, and Corpus Christi. Each court evolved its own type of spirituality — and foremost in each was the notion that a sovereign must be willing to sacrifice himself for his subjects, as Christ did for His. The greatest sovereigns were also accounted the most pious — both on their own behalf, and that of their peoples. The Five Wounds became a very powerful symbol for all who wanted to follow in the wake of Christ the King. The Portuguese Coat-of-Arms has borne them since Afonso I won the battle of Ourique against the Moors, beginning the Kingdom of Portugal. Rosaries and other devotions to Christ’s wounds abounded. The men of the North of England who rose to defend Catholicism against Henry VIII in the Pilgrimage of Grace marched under the Banner of the Five Wounds. The Protestant revolt caused mayhem throughout Christendom; and, as in England, those who fought for the Old Religion often rallied to the Five Wounds. But no realm in Christendom was more desolated by the Wars of Religion than France, where the Huguenots plundered and burned abbeys and shrines with great abandon. It fell to Henry IV and the House of Bourbon to rebuild his wrecked Kingdom; Henry’s son, Louis XIII, found himself in 1637 without an heir after twenty-three years of marriage and three miscarriages. But after much prayer to the Blessed Mother, the pious Queen, Anne of Austria, conceived, giving birth to the future Louis XIV on September 5, 1638. In gratitude, Her Majesty founded the convent of Val-de-Grace; the King consecrated France to Our Lady of the Assumption, and vowed that there would be processions in thanksgiving on that feast in perpetuity — a vow that (save during the Revolution) has been kept faithfully ever since. Whatever his many personal sins, Louis XIV, under the guidance of his pious mother, was quite devout. Together they had travelled to the shrine of St. Joseph at Cotignac in Provence during the regency following his father’s death. As a result, on March 12, 1661, three days after taking direct control of his kingdom, Louis decided to consecrate the realm to St. Joseph. To avoid appearing to contradict his father’s previous vow, Louis did so quietly in the chapel of the Louvre. But while all of this was going on, an obscure nun of the Visitation at Paray-le-Monial, Margaret Mary Alacoque, began receiving revelations from Jesus about the veneration and reparation due His Most Sacred Heart. These she shared with her confessor, Claude de la Colombiere, when he came to Paray in 1675. Most inspired by what he learned (which was in keeping with his own speculations on the topic), he began spreading this devotion at his next assignment the following year — chaplain to Charles II of England’s Queen, Catherine of Braganza. His headquarters was the Queen’s Chapel in London, at the time recently built to accommodate Catholic worship for Catherine and her circle. From thence he worked until imprisonment as a result of the Titus Oats plot forced his return to France. This request was sent to the King’s confessor. Although quite familiar, as we have seen, with the concept of national consecration, Louis XIV did not perform it — nor, indeed, did his great grandson and successor, Louis XV. But as the 17th and 18th centuries wore on, despite the heated opposition of Jansenists and “Enlightenment” partisans, devotion to the Sacred Heart grew. Bishops consecrated their own dioceses to it, as the City Council of Marseilles did, offering an annual solemn procession in thanksgiving for the cessation of the plague of 1722 (as with the Vow of the Assumption this practice has continued ever since, save during the Revolution). From the Jesuits and the Sisters of the Visitation, the Sacred Heart devotion leapt from order to order. But as St. Margaret Mary had written to Louis XIV, Jesus Himself wanted homage to His Sacred Heart to be made visibly on the part of the leaders of the various nations. Fortunately, if Louis himself was reluctant, many others were not. In 1695, Mary of Modena, Queen of the deposed King James II and living with him in France, sought and won from Pope Innocent XII a proper office and Mass of the Sacred Heart for the Visitation nuns. Three years later, she laid the cornerstone of a chapel dedicated to the Sacred Heart at the oldest Visitation convent in Paris (turned by Napoleon into a Protestant church, which it remains). The convent had been financed by her mother in law Queen Henriette Marie of England (widow of the murdered Charles I), another refugee at the French Court. Moreover, news of the Sacred Heart devotion began to trickle into Royal circles outside of France. In 1717, the Visitation sisters settled in Vilnius, Lithuania, and attracted the favor and support of Augustus II “the Strong,”Elector of Saxony, King of Poland, and Grand Duke of Lithuania (whose capital Vilnius was and is). They roused his interest in the “new” devotion, and in 1726 the King wrote Pope Benedict XIII, asking him to support the Sacred Heart veneration and reparation. Meanwhile, in Spain, Louis XIV’s grandson, King Felipe V, also heard the Divine call echoing around the House of Bourbon. In 1727, he too wrote a letter to Benedict XIII, asking him for a proper office and Mass for Spain and its dominions. Augustus’ unsuccessful rival for the throne of Poland was the Polish nobleman Stanisław Leszczyński. Although he would later manage to regain his Kingdom for a time (and then lose it again to Augustus’ son Augustus III, having to content himself with the Duchy of Lorraine thereafter), he shared with his rivals a love of the Sacred Heart. This he passed on to his daughter, Marie Leszczynska, who married Louis XV in 1725. The Queen and her parents prayed devoutly to the Sacred Heart for a male heir; the Dauphin was born in 1729. In response, she and her parents enrolled in the Confraternity of the Sacred Heart at the Jesuit Church in Blois. From that point on, Queen Marie became a tireless campaigner for the devotion, asking Popes Clement XII and Benedict XIV for a universal feast, and erecting a confraternity in its honour at Notre Dame de Versailles. Her zeal was shared by the Dauphin, and eventually her campaign for the Sacred Heart (and establishment of a proper feast for it) was taken up by prelates and princes across Europe and overseas: bishops from France, Spain, Poland, Portugal, Italy, Canada, Mexico, and Paraguay added their voices to the call. In 1761, Queen Maria I of Portugal, in thanksgiving for the birth of an heir, ordered the construction of the “Basilica da Estrela” in Lisbon, named actually after the Sacred Heart — it was the first great church in the world so named. The building was completed by 1789, at which time Maria ordered the Portuguese Orders of Knighthood to add the Sacred Heart to their coats-of-arms — in so doing she came the closest of any 18th century Monarch to fulfilling Christ’s command to Louis XIV. 1762 saw Augustus III of Poland, who like his father had also beat out King Stanislaw for the throne, ask the Pope to grant his country the Feast of the Sacred Heart. Oddly enough, his daughter had married the Dauphin Louis, Stanislaw’s grandson, thus becoming Queen Marie of France’s daughter-in-law. She came to admire the exiled King Stanislaw, who in 1763 then added his voice to Augustus’, requesting the Pope not only to grant the feast for Poland, but for his own consolation prize of Lorraine as well. A few days later, Maximilian III Joseph, Elector of Bavaria, petitioned the Pope for his own territories. In 1765, at Queen Marie’s request, the General Assembly of the Clergy of France added their voices to the chorus asking the Pope for the feast; it was fruitless, but two years later, to honour the Queen, the Archbishop of Paris ordered that the Feast of the Sacred Heart be observed in his Archdiocese. All of this royal agitation, while notable as far as what it shows concerned these Monarchs, also points out an unfortunate fact: not only did successive Popes not hear their call, but none carried out for their own countries what Jesus had asked of France and Louis XIV. Neither did Queen Marie, for all her zeal for the Sacred Heart, prevail upon her husband, Louis XV to consecrate his Kingdom. Indeed, the Catholic Rulers had another, more burning project in mind, which doubtless did not incline the Pontiffs to grant their several requests: they wanted (and eventually got) the abolition of the Jesuits, the order most closely identified at the time with devotion to the Sacred Heart. After the Jesuits were successively expelled from the territories of France, Spain, Portugal, Austria, and Naples, Pope Clement XIV was finally strong-armed into abolishing them wholesale in 1773. The pious Dauphin Louis having predeceased his dissolute father, the dissolute Louis XV was succeeded at his death in 1774 by the far more devout Louis XVI, his grandson. But although devoted to the Sacred Heart as his parents and grandmother had been, he too was taken up with other business — initially, reforming the economy and military. He was successful enough in this quest to defeat the British in his 1778-1783 intervention in the American Revolution — without which the colonial rebels would undoubtedly have been defeated. But financially, it was a pyrrhic victory that bankrupted the French government. When famine broke out in 1786, he was unable to do much to succor his starving subjects in the countryside. His sister, Madame Elizabeth, urged him to consecrate France to the Sacred Heart; concerned with what appeared to be more practical matters, he did not do so. In 1789, the dreary tale of the French Revolution began. As its earlier stages unfolded, many of the common folk sought refuge in the Sacred Heart; the period 1791-92 saw millions of its images spread among the populace. In the early months of 1792, virtually a prisoner in his palace, Louis XVI privately consecrated his Kingdom at last; moreover, he vowed that if restored to power, he would do so publicly. But the King was overthrown, and on August 10, 1792, the Royal Family became prisoners in the Temple. On January 21, Louis XVI was martyred, and his Queen, Marie Antoinette, followed him later in the year. Now it was the turn of the common man. On March 10, in the name of Louis XVII (the young imprisoned son of the murdered King), the peasants of the Vendee, in the west of France, rose up against the regicide Revolution. Elsewhere in France, the Chouans did the same. 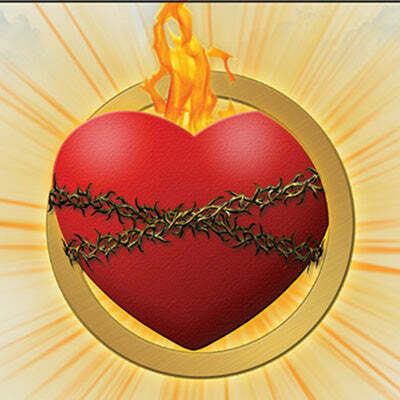 For all of these brave but doomed insurgents, the Sacred Heart became their badge of honour. In response, the Revolutionary regime banned the image. Christians who had pictures of the Sacred Heart were accused of “fanaticism,” and “distributing superstitious pictures;” which crimes led one to the guillotine. As the French Revolutionary Wars spread across Europe, its Catholic opponents in the Tyrol (where it remains to this day a powerful image of local identity), Naples, Piedmont, Tuscany, Lombardy, and elsewhere often adopted the Sacred Heart as their badge. For such as these, regardless of nationality, the Sacred Heart became a symbol not only of their own deposed Monarchs, but of that Kingdom of Christ of which their former rulers were lieutenants. It became a rallying point for all Catholics who opposed the attempted dethroning of Jesus by the revolution. After Napoleon’s defeat at Waterloo, it appeared that the genie of Revolution had been thrust back into its bottle. The Restoration saw the Monarchs back upon their thrones, and such measures as the Holy Alliance put in place to keep them there. Not surprisingly, in this period of peace, devotion to the Sacred Heart spread ever further throughout Europe. Louis XVIII and then Charles X were called upon to consecrate France publicly and fulfill Louis XVI’s vow. But they did not. In July of 1830, the very pious Charles X was deposed, and a new wave of revolutions hit Europe. His usurping successor, Louis Philippe, would not even consider it — and was deposed himself in 1848, as a new and far worse rash of rebellions spread across the continent. Out of it all, however, emerged France’s Second Empire. Although Napoleon III himself was continually torn between the two sides of his character — Catholic and Liberal — his pious Spanish empress, Eugenie, knew no such conflict. When the bishops of France gathered for the baptism of the Prince Imperial in June of 1856, she joined her voice with theirs in asking the Papal representative at the ceremony to ask Bl. Pius IX once more to place the Sacred Heart on the Universal Calendar of the Church. On August 25, he did so, finally fulfilling the requests of kings, clerics and faithful to his predecessors over the previous two centuries. But Eugenie would be less successful with her husband, whom she repeatedly asked to consecrate France to the Sacred Heart. Nevertheless, all over the world and in France especially, devotion to the Sacred Heart was literally reaching a fevered pitch, with new orders, sodalities, and movements of every kind dedicated to its veneration and reparation springing up all over. Nevertheless, Napoleon III collaborated with the Sardinians in the Franco-Austrian War of 1859, which allowed the latter country to begin the process of snapping up the Papal States. In response, the Holy Father called for volunteers from all over the Catholic world — the result was the formation of that splendid and legendary unit, the Pontifical Zouaves. In 1867, they made their first mass consecration to the Sacred Heart. The Franco-Prussian War broke out in 1870, and had several violent repercussions. The war went very badly; despite the Empress’ strident attempts, Napoleon III still not consecrate his country — he was defeated and deposed, through the war continued. His withdrawal of troops from Rome paved the way for the Eternal City’s conquest by the Italians. Those of the Papal Zouaves who were French returned to their homeland under their heroic commander, Athanase de Charette, and joined the French Army in an attempt to defeat the invaders. They received a banner of the Sacred Heart which circumstances had rendered impossible to give to the besieged garrison of Paris. The Zouaves carried it in all their battles, whilst repeatedly reconsecrating themselves — the last time at their mustering out at the end of the War. Associated with them in all these endeavours was the heroic and saintly General Gaston de Sonis. “In the presence of the misfortunes that afflict France and the greatest perhaps that still threaten woes. In the presence of sacrilegious attacks in Rome against the rights of the Church and the Holy See, and against the sacred person of the Vicar of Jesus Christ, we humble ourselves before God and our love together in the Church and our country, we recognize that we have been guilty and justly punished. Both the Pope and the exiled Comte de Chambord (de jure Henry V), exiled heir to the Bourbon throne, approved the vow — it was heartily taken up by Charette, de Sonis, and the Zouave veterans, as well as numerous others. Finally, on July 23, 1873, after acrimonious debates, the National Assembly passed a law providing for construction of such a Basilica as an expression of the national will. The result was the famed Basilica of the Sacred Heart at Montmartre. Inspired by the French example, on October 8, 1873, the heroic President of Ecuador, Gabriel Garcia Moreno, together with the country’s congress and Catholic Bishops, solemnly consecrated the nation — ever since, it has claimed the title of “Republic of the Sacred Heart.” Ten years later, work began on National Basilica in Quito. In 1902, after a rash of municipal consecrations, Colombian President Jose Manuel Marroquin also consecrated his country. There too this was accompanied by eventual construction of a National Basilica to the Sacred Heart in Bogota. So it has been with many other Latin American nations: El Salvador (1874), Venezuela (1900), Nicaragua (1920), Costa Rica (1921) , Brazil (1922) and Bolivia (1925) — all of which featured consecration by the Head of State, even as was required in Our Lord’s message to Louis XIV. In 1875, during the course of the Third Carlist War, the Carlist claimant to the Spanish Throne, Carlos VII,consecrated his ancestral realm to the Sacred Heart. Carlism was always devoted to the Sacred Heart, and its adherents added the image to both the arms and flag of Spain — again, in keeping with St. Margaret Mary Alacoque’s revelation. But all of this Hispanic fervour made little dent in France. As the Third Republic wore on, it became ever more anti-Catholic; several attempts were made to torpedo the construction of the Basilica on Montmartre. Although these attempts were defeated, the anti-clericals did manage to strip the effort of its governmental approbation. At last, in 1906, Church and State were separated, church property seized, and most religious orders expelled. So things stood when war broke out in 1914. At the same time, however, throughout France and the Catholic world, Royalists and others interested in the Social teachings of the Church began exploring the relationship of these to the Sacred Heart. From the writings of such figures as Cardinal Pie, Fr. Fanno Solaro, S.J., and many others came the idea of the “Social Kingship of Christ” – that, that Christ must reign as King over every element of Society, from the Headship of State to the lowliest cottage. There was a great highpoint to these developments in 1900, when Leo XIII solemnly consecrated all mankind to the Sacred Heart. The cause of Christ the King united Catholics across the globe, each in their various political difficulties. These would be exacerbated by the outbreak of World War I. The horrors of the trenches ground on, and at last, on January 16, 1917, French mystic Claire Ferchaud wrote a letter to President Raymond Poincaire. In it she called on him to win the war by gaining Christ’s blessing on the country. This he was to do by rejecting Freemasonry, placing the Sacred Heart on the French national and battle flags, and giving images of it to soldiers to wear. She underlined these appeals by visiting him personally on March 21, at which time he said he could nothing because of the country’s anti-clerical laws, and that it was a matter for Parliament. Five days later, at the Basilica in Paray-le-Monial, the flags of the allied nations were solemnly blessed by the British Archbishop of Westminster and the French Bishop of Autun. On May 15, allied soldiers gathered again at Paray, and were solemnly consecrated to the Sacred Heart by Cardinal Amette, the Archbishop of Paris. Official reaction was swift. In July, the government prohibited soldiers to be consecrated to the Sacred Heart or carry its image; nor could military flags carry the device. The following August, the allied governments rejected Pope Benedict XV’s peace plan. The only ruler who showed any interest was Bl. Charles I, Emperor of Austria, whose own devotion to the Sacred Heart was renowned. In the same year, the apparitions of Fatima occurred, during the course of which devotion to the Sacred Heart was explicitly linked to that of the Immaculate Heart of Mary. So too was the idea of national consecration — Our Lady asked that the Pope and all the Bishops of the World would consecrate Russia to her Immaculate Heart. Despite the ministers in Paris, reality prevailed to some degree at the front. On June 7, 1918, in defiance of the law, Marshal Ferdinand Foch, having allowed the image of the Sacred Heart to be borne on flags and worn by soldiers, privately consecrated his army to the Sacred Heart at the parish church of Bombom. A few days later, he and his men defeated the Germans at the Second Battle of the Marne — which decisive victory he attributed to the Sacred Heart. In November, he accepted the German armistice. The war was over — but at what a cost! Spain had remained neutral; grateful for this, on May 30, 1919, King Alfonso XIII solemnly consecrated Spain to the Sacred Heart at Cerro de los Angeles, the geographical center of the country. The 1920s saw continued growth of devotion to the Sacred Heart, most especially enthronement of its images in private homes and other devotions. At the same time, devotion to Christ the King grew, culminating in Pius XI’s 1925 encyclical, Quas Primas. This established the Feast of Christ the King (whose processions would become a rallying point against Nazi tyranny in Germany), and made “Long Live Christ the King!” a shorthand code for all who upheld the Catholic social order against any opposition. Pope Pius made recitation of the Act of Dedication of the Human Race an integral part of the observance. It was little surprise that invocation of their Divine Sovereign was constantly of the lips of the Cristeros and the Spanish Nationalists. World War II broke out in 1939, and would have even more horrible consequences than its predecessor. On June 1, 1940, as the French army was tottering under German assault, Cardinal Suhard, Archbishop of Paris consecrated his see and France in the Basilica at Montmartre. Although 50,00 were present, including some important officials, the President and Premier were not. On June 16, the government fell, and Marshal Philippe Petain became Head of State, with half the country under German occupation. On November 22, 1940, Petain privately consecrated France to the Immaculate Heart of Mary, asking the Papal representative in attendance to inform Pius XII that he wished to make it publicly “in the hands of His Holiness,” and expressed the wish that the Pope would so consecrate the whole world. This the Pontiff did on October 31, 1942, renewing it solemnly on December 8. On January 28, 1943, a delegation of Catholics met with Petain in Vichy, and presented him with a flag depicting the Sacred Heart of Jesus. The Marshal expressed his happiness with it, and declared it to be “my flag.” Meanwhile, Cardinal Suhard had been to Rome, and seen Pius XII. Upon his return he conferred with the other French Bishops, and it was agreed that the Consecration of France to the Immaculate Heart of Mary would be made at the same time in all French churches and chapel at the same time on March 28. Hearing of this, Petain declared that as Head of State he would join the effort. At that date and time, the Church of St. Louis in Vichy, Petain solemnly consecrated France to the Immaculate Heart. Emboldened by his actions, Fr. Merme, who had arrange for the flag to be given him, asked the Marshal on June 29 to consecrate France to the Sacred Heart as well, Although Petain responded that he would consult the French bishops about doing so, he said he did not think it would be possible at that time, although, “If its implementation does not currently seem appropriate, it does not mean that it is excluded.” Of course, the Allied invasion and Petain’s subsequent imprisonment by the Germans ended any chance of that happening. Europe was devastated by the War, and half of it was swallowed by the Communists. But there were signs of hope elsewhere. On October 27, 1946, King Mutara III consecrated his country, Rwanda, to Christ the King, declaring: “Lord Jesus, King of all men and all nations, I, Mutara Charles Léon Pierre, bow to you and to your mother, Mary, Queen of the earth and heaven. I recognize that you are the sovereign Master of Rwanda, the root from which comes all power…. Lord, I give you my country, my countrymen, and my person.” Given the tragedies that dogged the country’s later history — starting with Mutara’s mysterious death — he gave his countrymen something to hang on to. On October 11, 1954, Pius XII issued the encyclical Ad Coeli Reginam, which enacted the Feast of the Queenship of Mary. The following July 25, the President, Congress, and Supreme Court of Brazil consecrated the nation to the “Eucharistic Heart of Christ the King,” at the statue of Christ the Redeemer on the top of Rio de Janeiro’s Corcovado mountain — expressly citing the request to Louis XIV. The excitement during and after Vatican II had, among other things, the result of dimming — for a while — a great deal of popular interest in the Sacred Heart devotion. In much the same manner, the apparent reconciliation of the Church with the modern liberal state put something of a damper on specifically Catholic social and political work, as opposed to simply assisting the status quo. Those days, thankfully or not (reform in the Church often presages governmental and other persecution), are ending. Where, in the light of all the history we have reviewed, does that leave us? For starters, we have to fix in our minds just what Our Lord’s Sacred Heart demands of us in our own context. It is hard to envision any government, anywhere today (save perhaps Liechtenstein), where the Head of State would consecrate his country to the Sacred Heart in union with the country’s hierarchy — imagine President Obama doing that! So we must pray and work in hopes that such a regime may one day surface in each of our countries. It may just be possible to do this on a provincial or state level, as Governor Cesar Duarte did with the Mexican State of Chihuahua on April 20 of this year. Some cities might well be able to do so — although doubtless the American Judiciary would forbid any such action. Dioceses and parishes of course are another matter, and many have been consecrated to the Sacred Heart; more can be and others reconsecrated. Corpus Christi and Christ the King processions are very important in showing our corporate allegiance. Every family should enthrone the Sacred Heart, and show that in that home at least, Christ is truly King. For each of us as individuals, devotion to the Sacred Heart and its allied devotions of the Immaculate Heart, Precious Blood, Divine Mercy, and Kingship and Queenship of Jesus and Mary — starting with things like the First Fridays and First Saturdays — should be paramount. In the current climate (where mentioning “Christmas” can be a risk), displaying the placard of the Auto League of the Sacred Heart so far from being tacky becomes an heroic and counterrevolutionary act!